Figure 6: (a) Schematic of the sharp-edge-based acoustofluidic pumping device. This device includes a PDMS microfluidic channel and a piezoelectric transducer. (b) Schematic showing the acoustic streaming phenomenon around the tip of a tilted oscillating sharp-edge structure. (c) Schematic showing the design of the channel and sharp-edge structure. We developed a programmable acoustic-based pump that utilizes the acoustic streaming effects generated by the oscillation of tilted sharp-edge structures. 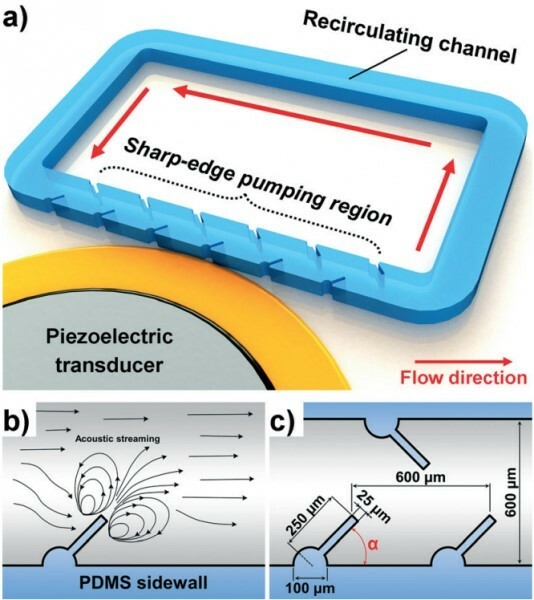 This sharp-edge-based acoustic pump is capable of generating stable flow rates, and it can tune flow rates across a wide range (nanoliters to microliters per minute). Along with its ability to reliably produce stable and tunable flow rates, the acoustic pump is easy to operate and requires minimum hardware, showing great potential for a variety of applications.